There might be times where the cadre make you dump everything out of the pack. Then -very- quickly put everything back into the ruck. The easier the system and organization, the better. Some people over-complicated their setup, so when it was time to unpack and re-pack, there was no time to put it back together in the very specific order they were in. Keep it simple. Most rucks/packs have multiple compartments. Certain items that has to be accessed quickly should be stored alone, so there is no ‘digging around’ when you need it (e.g., headlamp, gloves). For weights, I used a box to enclose four (4) 3lb dumbbell plates, then duck tapped all around it to add rigidity and some water-resistant to the box. I did this to make the shape of the weight “longer” so it will take up the whole height of my ruck (now I use metal ruck plates, read comparisons of ruck plates here). I placed two pool noodles beside the weights to help secure it from moving side to side in the ruck. A pelican case is also thrown in next to the pool noodle to store some energy bars. I opted to put my food in a case instead of the dry sack to reduce the amount of time needed to get the food out. Duck tapped box with four 3lb dumbbell plates + foam to secure the weights to the top. Pool noodles to reduce side-to-side movement of the weights in the pack. Pelican case with energy bars. In the same main compartment, I have my bladder and dry sack lay on top of the weight. The dry sack carries an extra shirt and socks. 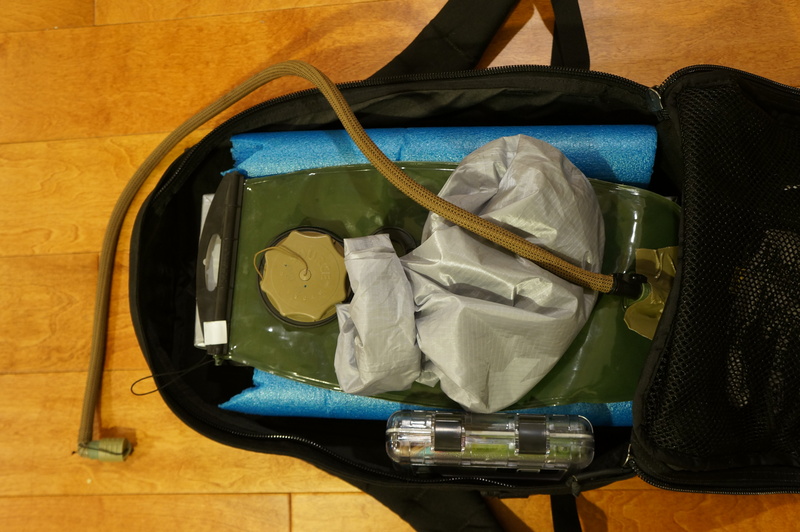 Because of how full the ruck is, the bladder stays upright without needing to be suspended. I used a Source WXP 3L bladder, which actually started leaking -very slowly- at the seam where the hose connects to the bladder right before the event (see duck tapped portion of the bladder). Again, bring two (2) bladders/water container. I finished without needed to add more water, but it was a close call. Bladder lays flat on top of the weight. Note that nothing is fastened down. In the case where I have to unload everything, easy unpack, easy repack. I stored my headlamp and a pelican case with personal items in the top compartment inside the ruck for easy access. 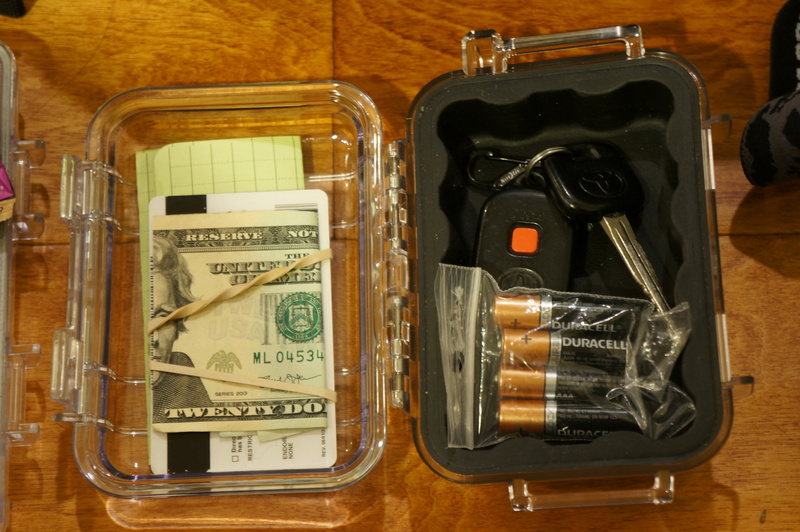 Pelican case with piece of paper (personal info, phone #s), cash, ID, spare batteries, and car key. When I zip it up, there is a bit of room to spare, and the laptop compartment at the back is still empty. I stored my wind breaker in there. GR-0 with reflective ankle bands around the molle, an ITW tac-link to attach my gloves to the exterior. 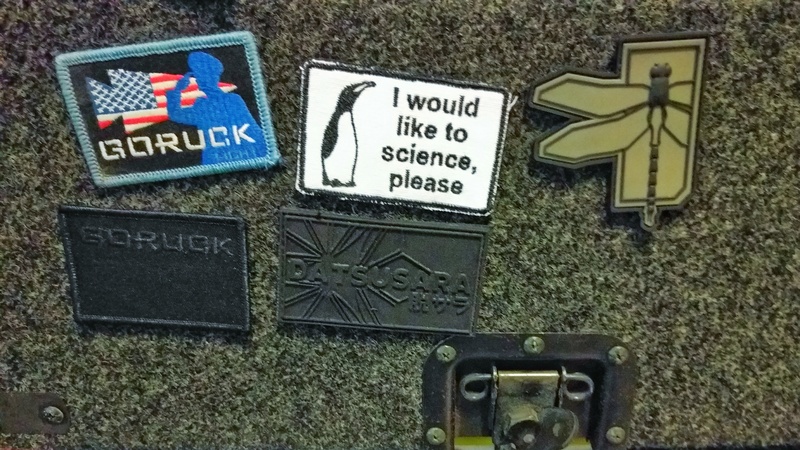 And, the science-penguin patch. 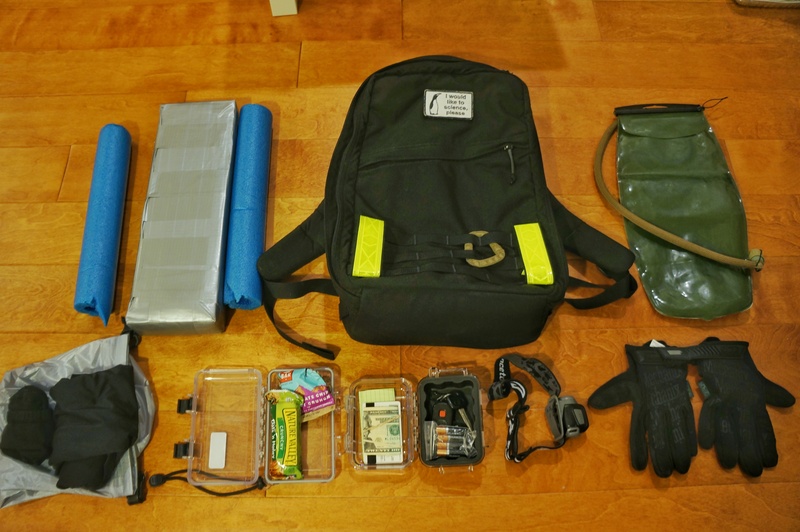 According to the official packing list for GORUCK Light, these are the required and recommended items. The weight requirement has been updated to officially allow steel plates (ruck plates) to be used as weights as well. If you are going to hack your weights in some different ways, check with the event’s cadre (GORUCK event leader). I posted on the facebook event group before to ask if the way I carry my weight is acceptable. Q: Is it okay to use <insert whatever item> to be my weight for the GORUCK Light/Tought/Heavy? A: Check with the event’s cadre. Some might let you, some might not. Q: Is my <insert whatever backpack> okay to do an event? A: At the least it has to be able to safely carry the weights. For GORUCK Selection (the ultimate event), it has to be a GORUCK pack, but other rucks/packs are allowed for normal GORUCK challenges. Q: Why do we need reflective band/PT belt? Q: Gloves are not required but recommended, should I bring a pair? A: Yes. I did not see one person without gloves during the event. They recommend mechanix gloves, but any work gloves will do if price is an issue. Q: What time should I show up for the event? A: I showed up 30mins early to find people already there. It is good to show up early to check each other’s gear. Some people might be missing an item (or two), and hopefully there is enough time to fix it if people show up early. Q: Would the event run longer than the stated time? A: Probably. Don’t schedule anything important right after 🙂 It is really up to the cadre when the event ends. Q: Is training <insert length of time/intensity> enough? 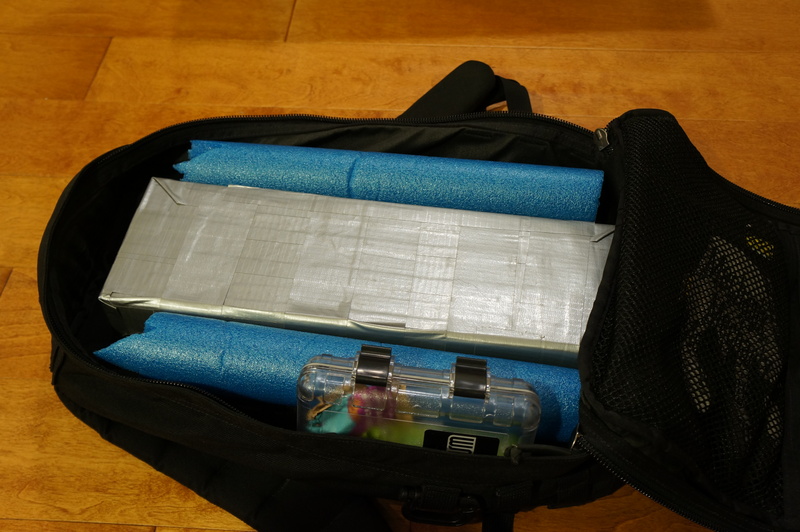 A: I followed the 6-week training plan provided by GORUCK starting about 12 weeks before the race. My plan was to do the training plan twice. I completed the first cycle, and didn’t start again. I kept my usual routine of BJJ and strength training, with an occasional hike here and there. 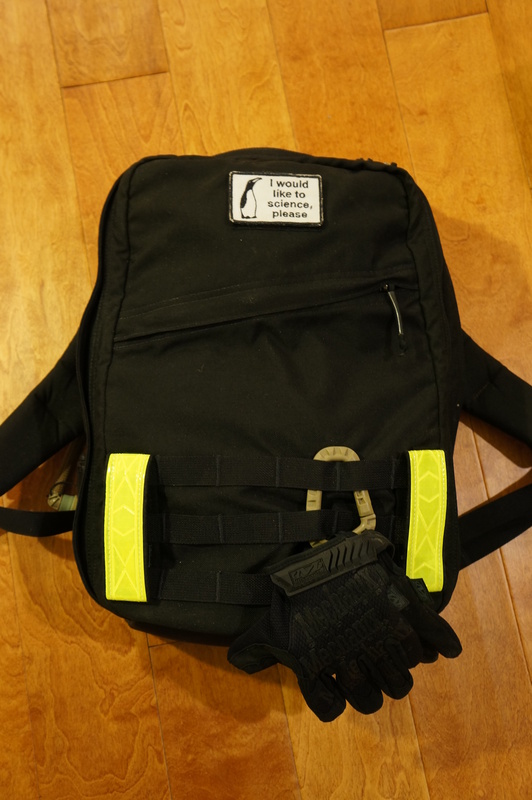 The GORUCK Light should be do-able as long as you are physically active. I could not speak for the more challenging events (e.g., GORUCK Tough or Heavy). But if I was to do a Tough, i will definitely train my rucking-endurance a lot more. Q: Would I enjoy an event? BONUS: I was at a Veterans Day event, so I also learned about Veterans Day and other history. Goruck Light patch joining my small patch collection. Nicely done! Prior proper planning prevents piss poor performance! Read and heed for a successful ruck!